It's been awhile since I posted.... life happens, right? I did post about our daily schedule here when I linked up with my friend Kerry, but I haven't really posted since we went to the Canary Islands back at the end of May! So time for a real update! We were pretty low key for awhile when we returned from the Canary Islands -- because we started potty training. And well, it was much easier than I thought and I completely absolutely believe it is because the Peanut's school is doing 95% of the work. Yes, you read that right. Many preschools here work on potty training around this age (actually Serafina is on the older side of potty training in Spain). No pictures because there was (and still is) lots and lots of naked time! Overall, it is going well but the real test will be our upcoming trip to France.... how do parents travel with newly potty trained kiddos? All advice and tips are welcome! We had family pictures taken by my friend Erin and we could not be happier with how they turned out! 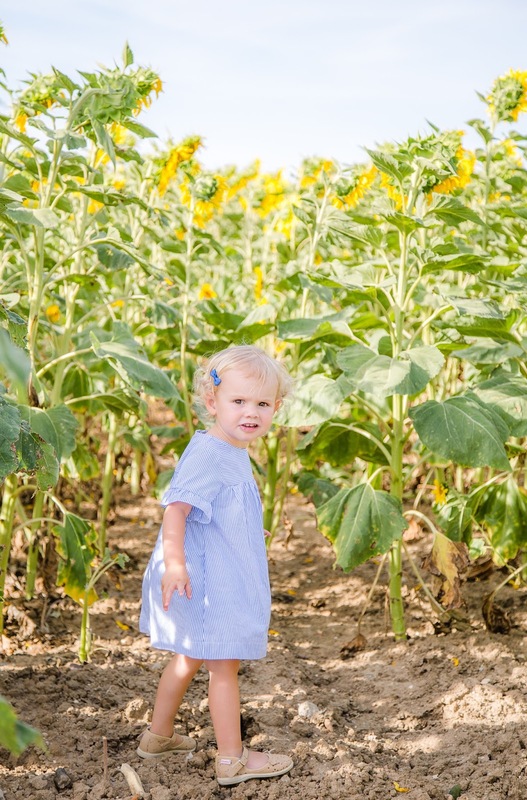 Our area is known for its sunflower fields this time year, so many of the local (American) photographers offer mini sessions for pictures. It was the perfect amount of time for our active toddler (who had way too much fun just looking at the flowers and finding bees). 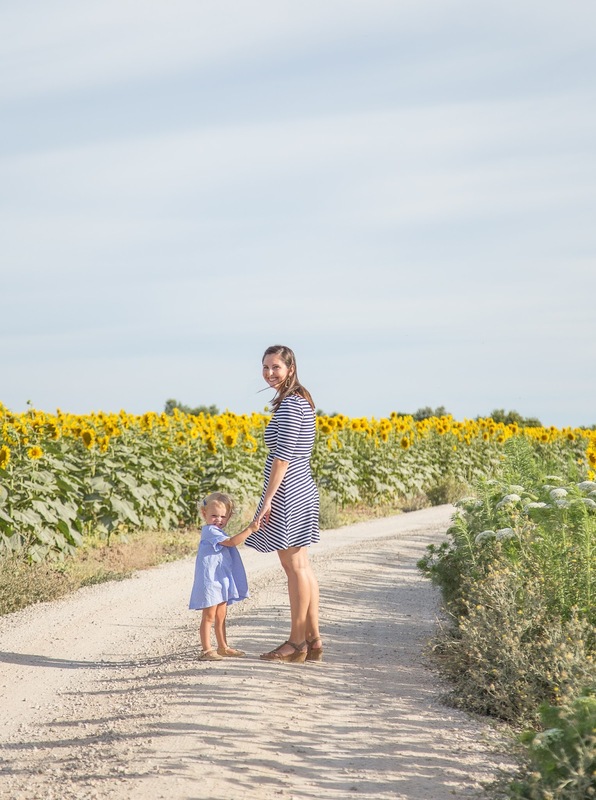 I am so thankful we have these unique family pictures to document our time in southern Spain.... now to figure out which prints to actually order! We also had a wonderful Father's Day (I should say American Father's Day since Spain celebrates theirs in February). We went to our local goat farm with some friends -- we had a tour, ate a lot of yummy cheese and meats, got to play with the baby goats and even make our own fresh cheese! It was so much fun and all the toddlers had a blast running around with the baby goats. We even saw a baby just after it was born, witnessing its first steps and first time nursing from mama! The Peanut had her "fin de curso" -- end of year celebration (she is still going to school throughout the summer, but their year really goes September to June). And it was just about the cutest thing I have ever witnessed. Each class did a dance complete with costumes and choreographed moves! Our sweet gal just stood on stage for her whole 2 minute performance but later danced her little heart out doing all the moves when her song came on between acts! And in true amazing Spanish fashion, drinks (alcohol) and food was served -- sure makes school functions so much better! Our 4th of July was low key given that it isn't a holiday in Spain -- we sent the Peanut to school in the morning! We had the celebration on base the weekend before the 4th, but just like last year we didn't stay too long -- hot and not a whole lot for the little girl to do! Other than Trevor having the day off, it felt just like a normal Tuesday! We've been hanging with friends, going to the beach, staying out way past our bedtimes, eating a lot of ice cream -- normal summertime adventures! Hope everyone else is enjoying their summer!